Castel-Q Focusing Rack is rated 4.8 out of 5 by 12. Rated 5 out of 5 by Bob Abela from A solid focus-rack I compared with a few of the higher-end focus racks after getting tired of compromising on the cheaper ones. This one is sleek, solid, and compact; mounts nicely on my an Acratech GP-S. Adjustments are smooth and precise. You can adjust tension without a need to over-tighten. Minor beef is that the tension knob can easily unscrew off. Be aware that this model does not offer a way to rapidly move forward or back, though this is not an issue for me. If you need this, consider the Castel-XQ model or the RRS B150-B. Rated 5 out of 5 by Anonymous from Art in Metal If you want to mount a camera for macro use, this is the best available. If you want to mount a lens, get the Kirk macro rail (the quick release can be rotated). This rail won't fit the RRS lever quick release (I had to swap mine out), so be warned against RRS clamps. Once you've worked with this rail, others seem antiquated and crude. This product is perfectly thought out and brilliantly executed. Rated 5 out of 5 by uncle from Fine piece of engineering Solid build and very smooth movement in very fine increments, if necessary.My only gripe would be, that the knob that drives the stage would benefit from being a bit bigger (there's a fine focus attachment for it, but that is an additional $) and/or having a degree scale or click stops, as it would make focus stacking a lot easier. I did a quick focus stack (in CombineZP and Picolay), which came out fine, but having a way to move the stage in consistent increments would be a big plus. 5 stars nonetheless. Rated 5 out of 5 by R from Excellent Focusing Slider Excellent macro photography slider. Good for macro subjects up to about 10 CM in depth. Easy to get about 0.5 mm adjustments. Less than 0.5 mm adjustments are problematic. Excillent build. I don't need to use the locking knob unless I am more than about 30 degrees from level. Castel-Q works well with my Acratech tripod head and quick-release plate. This slider is a big improvement over the Velbon Super Mag Slider. Rated 5 out of 5 by itoona from Completed my dream macro rail set Already purchased and am using a Novoflex CASTEl L, but the one direction (in/out), just wasn't sufficient for good macro work. The quality of the Novoflex rails is excellent and B&H Photo processed & shipped my order quickly and was well packed/protected. Just added a new 3-way Manfrotto tripod head and am ready to conquer the world of macro photography. Rated 5 out of 5 by Animation student _ Jewelry Photographer from Amazing Stability I used this rail in a stop motion animation where i had to move the camera vertically each frame.this rail had no problem holding the position of the camera for each frame even with the camera mounted via and l bracket and a 135mm lens on it. No slipping at all. Rated 5 out of 5 by Michel from Smooth and Precise Rail all about Arca Swiss compatibility I was happy to see the precise fit for the plate and the base. This is a work of art. Rated 5 out of 5 by Anonymous from love it! Smooth and accurate moving good for my MP-E 65 's fine focussing! I have a Arcratech Ultimate GP Ballhead. Can the Castel-Q focusing Rack be used on this system or does it require some sort of adaptor? The Novoflex Castel-Q Focusing Rack can be used with the Arcatech Ultimate GP Ball head, as well as any other Arca-Swiss compatible quick release clamp, and any conventional tripod head. Novoflex Castel-Q Focusing Rack - with Arca-Type Quick Release (Requires Plate) Is this a quick-release plate that attaches the DSLR (Canon 5D Mk III in my case) to the Focusing Rack? Which plate is required?Thanks! Hi, i Have bought this product in Dec 2013 from the store. but now due to some reason the threading in the rail in damaged. How can i get the Threading strip for this rail? Is there a way to move the plate quickly from one position to another before using the micro adjustment or is there only one speed? It is one speed and does not have a release to move it quickly. Is this focus slider takes wimberley, markins, mefoto or sunwayfoto arca swiss compatible quick release plates? In the image above it appears that the top quick release clamp is too shallow. please answer. 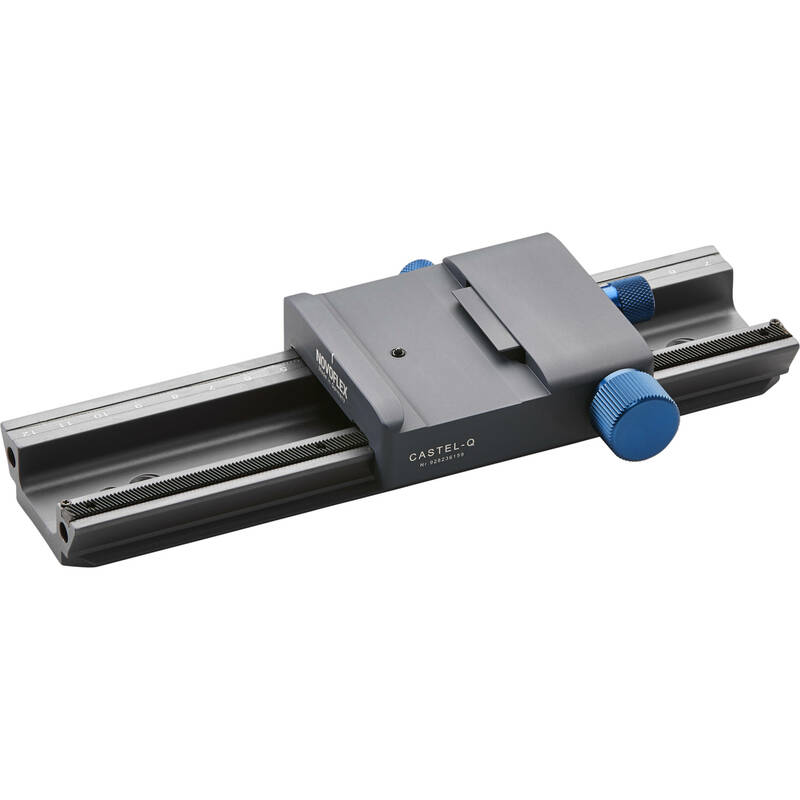 I am asking that other make QR arca swiss plates apart from novoflex itself are compatible with this slider? Asked by: DR.KISHORE KUMAR M.
It doesn't accept Manfrotto size plates, but it does accept my arca-Swiss size Induro plates. Hope this helps you. Will Really Right Stuff L-brackets attach to this? Will Really Right Stuff L-brackets attach to a Castel-Q? Richard, I don't have the Really Right Stuff L-bracket so I can't be sure if it fits. Some internet sites say it fits, others say it doesn't. So to give you the best information, I measured with a caliper the plates I have that fit. A Novoflex QPL2 plate measures 39mm at the dovetail part. A Sirui plate also measures 39mm. So the dovetail part of your L-bracket must not measure more than 39mm to fit the Castel-Q. I also measured the interior of the opening of the Castel-Q and it is 40mm. Please tell me if this helps!